Caroline is showing off the tree that she "planted." She found a big branch in the woods and brought it over to the horse shoe sand pit. She was very proud! Tucker insisted on wearing these Spiderman shoes that were way too big for him. But, with the velcro tight enough, he was able to walk without his feet coming out. He loved it! Caroline was in the ferret pin petting Ms. Gina's ferret, Nina. I guess Tucker was getting bored and decided to hang on the grill. Thankfully, we did not use that one so it wasn't hot. 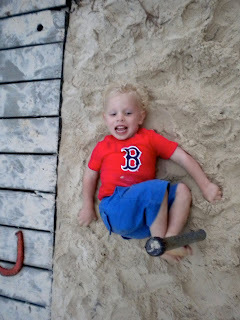 Then he decided to roll around in the sand pit. 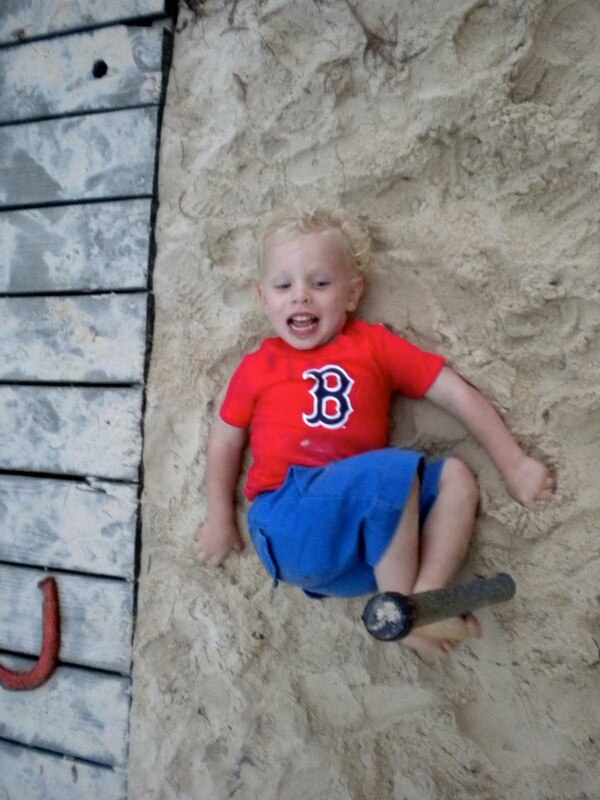 So, not only did he smell like Lake Cheston, but he also had sand all over him!